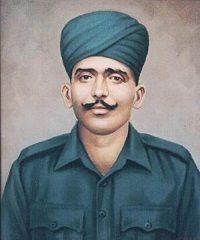 Naik Jadunath Singh was born on 21st Nov 1916 in Khajuri village of Shahjahanpur district in Uttar Pradesh. Son of a poor farmer Sri Birbal Singh Rathore and Smt Jamuna Kanwar, Naik Jadunath Singh was one of the eight siblings- seven boys and a girl. He did not have access to good school education and till class 4 , he attended the village school, simultaneously working in the fields or at home to contribute to the family. He was known in his village as a wrestling champion who would often take on the rogue elements of the village. Naik Jadunath Singh was enrolled in the Rajput Regiment on 21 Nov 1941 at the Regimental center Fatehgarh. After completing his training he joined 1 Rajput and also took part in World War II, proving his mettle even then. After about 6 years of service, he was promoted to the rank of Lance Naik in July 1947. In Dec 1947, Naik Jadunath Singh’s unit, 1 Rajput was deployed in J & K to take part in the ongoing war with Pakistan after it had attacked Kashmir in Oct 1947. On 28 Oct 1947, India officially declared that it would help J & K against the attack of Pakistan after Maharaja Hari Singh of Kashmir formally decided to merge with India. Pakistan made simultaneous attacks on many fronts and Taindhar was one such front in Naushera sector. It had great importance for the enemy as it could have paved the way for them to take over the control of Srinagar airfield. 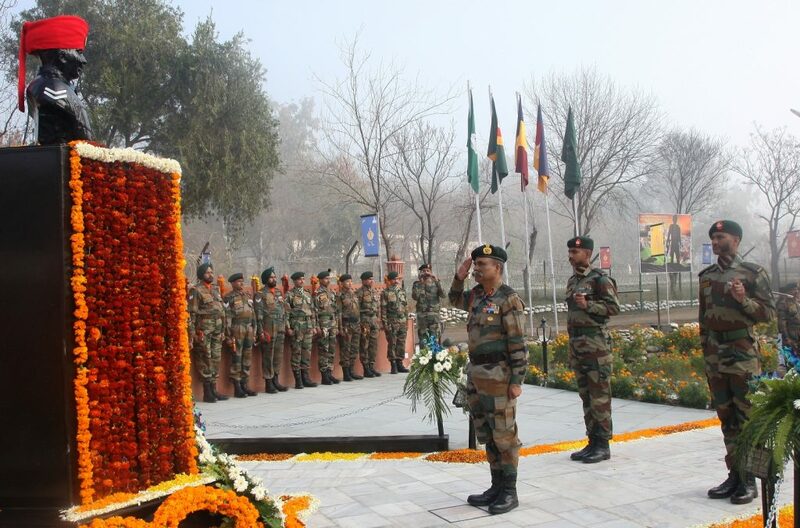 On 01 Feb 1948, India’s 50 Para brigade attacked Naushera and gained control over it. Pakistani soldiers suffered heavy casualties and had to retreat. On 6th Feb 1948, the enemy began the attack on this sector by opening fire on the pickets of Taindhar ridge. The whole ridge and surrounding hills were under gunfire and mortar fire. Meanwhile, in the cover of darkness, the enemy made their way to the Indian pickets. The dawn of 6th Feb saw successive attacks by the enemy to capture the post. Naik Jadunath Singh, who commanded the picket No.2 displayed remarkable valor and profound leadership. With his small force, he managed to make the enemy retreat in confusion. In the attack, four of his men were injured, and he re-organized the forces for another attack. Despite being outnumbered and injured, his forces continued guarding their post. When his Bren-gunner was injured, he personally took over the Bren-gun. The enemy emerged for another attack, this time right on the walls of the post. But his offense was so strong that he turned what looked like defeat into a victory and saved the post a second time. By this point, he had lost all the men of his post. The enemy launched a third attack to capture the post. Naik Jadunath Singh charged the enemy with his sten gun, despite being alone and wounded. The enemy, surprised by this daredevilry fled in disorder. During this exchange, two enemy bullets pierced his head and chest and Naik Jadunath Singh was martyred. 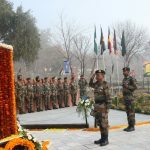 At such a critical stage for Naushera, he saved his picket and was honoured with the nation’s highest gallantry award, “Param Vir Chakra” for his outstanding bravery, unyielding fighting spirit and self-sacrifice for the nation. 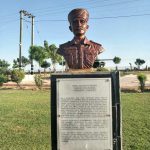 At No 2 picquet on Taindhar on 6 February 1948, No 27373 Naik Jadunath Singh was in command of a forward section post, which bore the full brunt of the enemy attack. Nine men against overwhelming odds garrisoned the little post. The enemy launched its attack in successive waves and with great ferocity to overcome this post. The first wave swept up to the post in a furious attack. Displaying great valour and superb qualities of leadership Naik Jadunath Singh so used the small force at his disposal that the enemy retired in utter confusion. 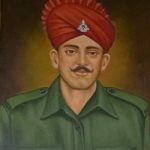 Four of his men were wounded but Naik Jadunath Singh again showed his qualities of good leadership by reorganizing the battered force under him, for meeting another onslaught. His coolness and courage were of such an order that the men rallied and were ready for the second attack which came with greater determination and in larger number than the preceding one. 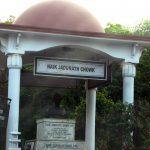 Though hopelessly outnumbered, this post under the gallant leadership of Naik Jadunath Singh resisted. All were wounded, and Naik Jadunath Singh, though wounded in the right arm, personally took over the Bren gun from the wounded Bren gunner. 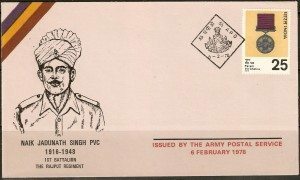 The enemy was right on the walls of the post but Naik Jadunath Singh once again showed outstanding ability and valour of the highest order in action. By his complete disregard for his personal safety and example of coolness and courage, he encouraged his men to fight. His fire was so devastating, that what looked like impending defeat was turned into a victory and the enemy retreated in chaos leaving the dead and wounded littered on the ground. 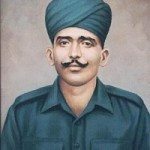 With this act of supreme heroism and outstanding example of leadership and determination, Naik Jadunath Singh saved the post from the second assault. By this time, all men in the post were casualties. The enemy put in his third and final attack in undiminished numbers and determination to capture this post. 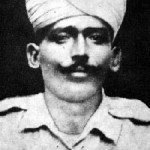 Naik Jadunath Singh, now wounded, prepared literally single-handed to give battle for the third time. With great courage and determination, he came out of the sangar and finally with the Sten gun, made a most magnificent single-handed charge on the advancing enemy, who, completely taken by surprise, fled in disorder. 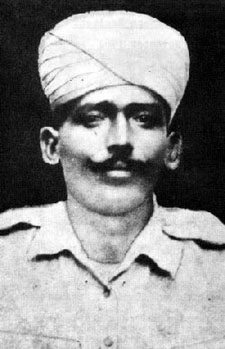 Naik Jadunath Singh, however, met his gallant death in his third and last charge when two bullets hit him in the head and chest. 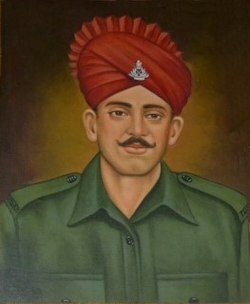 Thus, charging single-handedly at the advancing enemy, this Non-Commissioned Officer, performed the highest act of gallantry and self-sacrifice and by so doing saved his section-nay, his whole picket from being overrun by the enemy at the most critical stage in the battle for the defence of Naushera. 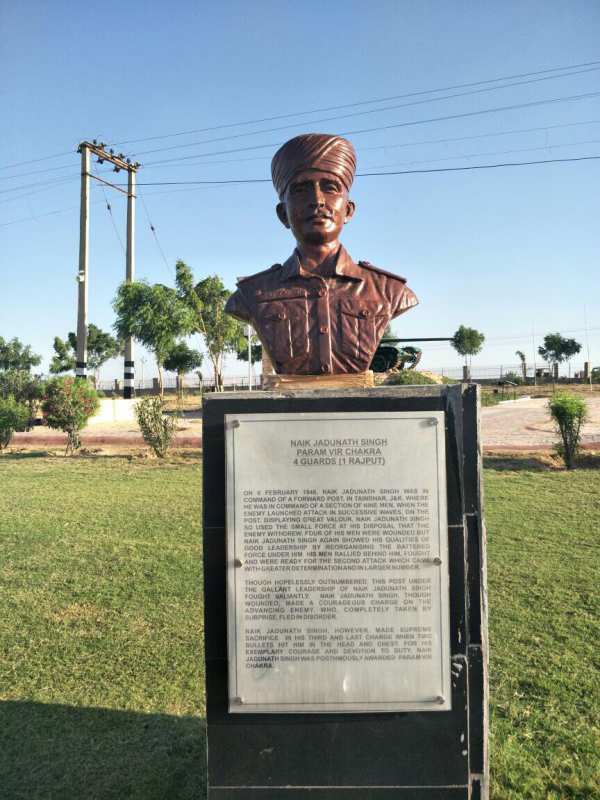 A sports stadium in his birthplace Hathoura Bujurg in Shahjahanpur, Uttar Pradesh is named as ‘Param Vir Chakra Naik Jadunath Singh Sports Stadium’ in his honour. His battalion, the 1 Rajput was awarded the Victoria Cross. India Post released a Commemorative stamp on 15 Sep 1998 to mark Bicentenary of the battalion. 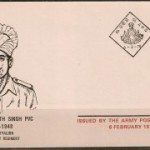 The First day cover released on 15 Sep 1998 shows a Param Vir Chakra which was awarded to Naik Jadunath Singh. The Shipping Corporation of India Ltd (SCI), named fifteen of her Crude Oil Tankers in honour of the Param Vir Chakra recipients. The crude oil tanker named MT “Naik Jadunath Singh, PVC” was delivered to SCI on 21-09-1984. 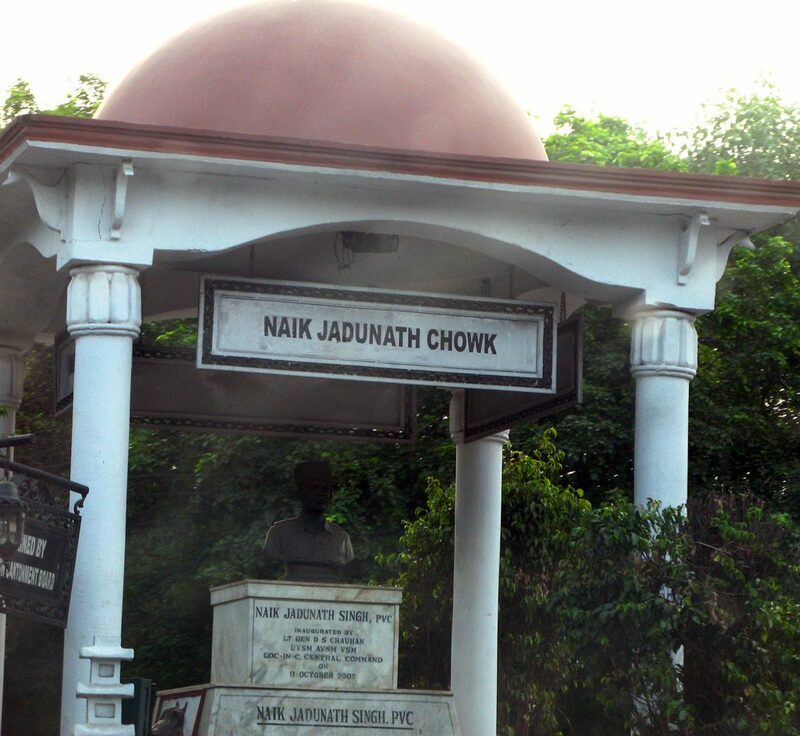 The Housing project of Jadunath Enclave in Faridabad was named after Naik Jadunath Singh PVC. Honourpoint.intakes utmost precaution towards factual correctness of the uploaded data and makes sure that the data is from a credible source. 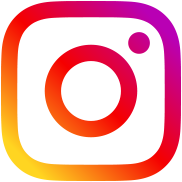 However, we do not take responsibility for authenticity of the content and Honourpoint.in or any of its members cannot be held responsible for any misappropriation of the uploaded content. Jai hind. Rajput regiment. Bajrang bali ki jai.